A photograph of Mars taken by Viking 1 satellite owned by the United States on July 25, 1976, triggering thousands of conspiracy theories. The photograph was surprising, because revealing a human face-like protrusions on the surface of the red planet – complete with eye shape, nose, and mouth. Post-discovery, speculation develops. Many consider the structure of the human face is artificial intelligent beings in the past inhabitants of Mars – evidence of the existence of ‘aliens Mars’. In fact, the U.S. space agency, NASA has explained the phenomenon, on July 31, 1976. NASA explained in a release, ‘the face of Mars’ is the mesa – steep rock formation with a relatively flat peak. “This picture shows eroded mesa that resembles a human head – show illusions such as eyes, nose and mouth,” said a NASA release to the media at that time. 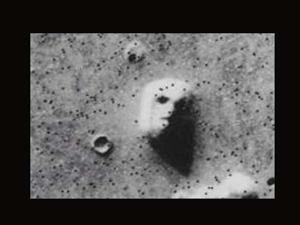 Described Mars, the photo was taken on July 25, 1976 in the range of 1873 kilometers distance. However, that explanation was not working. The conspiracy theorists insists, ‘face’ is an ancient artifact of human civilization on Mars. They even accuse NASA deliberately covering up the existence of life outside Earth. In fact – when the NASA satellite re-take the photograph the same object in the 1990s and 2001 – indicating that the ‘face was just a steep hill. The latest photo released Friday, July 30, 2010, further strengthened its rebuttal speculation. Sophisticated camera captured image belongs to the U.S. space agency, NASA, HiRISE shows a human face on Mars is a large rock hill in the middle of the desert. HiRISE image produced is a photo of the nearest object was phenomenal. HiRISE took images of Reconnaissance satellite orbiting 300 miles above Mars – much closer than the position in 1976, 1873 miles.